While food is essential to living, it is meant to be savored and enjoyed as well. On an American Queen Steamboat Company river cruise you can indulge in some of the finest dishes you’ll find both on and off the water. Read on to learn what to expect for your dining experiences. Onboard world-class chefs believe in using fresh, local ingredients to give you a taste of authentic regional cuisine. From Pacific Northwest flavors to traditional Southern cooking, you will never go hungry. Breakfast is offered daily in the main dining room, lunch varies depending on the cruise and can also be eaten off-boat as part of a shore excursion, and dinner is served in the main dining room of each vessel. With dinner, wine and beer, along with a variety of themed cocktails and non-alcoholic beverages, are complimentary. Each AQSC vessel offers a unique dining room experience. On the American Duchess, for instance, you’ll be surrounded by traditional European sophistication, including rich fabrics and wood accents. While the suggested dress code is country club casual, elegant resort wear is also appropriate. Enjoy a more casual breakfast and lunch, but show off your glamorous and sophisticated outfits during dinner if you choose. Were you so busy that you missed a meal? With AQSC, you’ll never go hungry with 24-hour room service. Bonus—they also accommodate special dietary needs. You don’t even need to tip your waiter—gratuity is automatically placed on your onboard account. 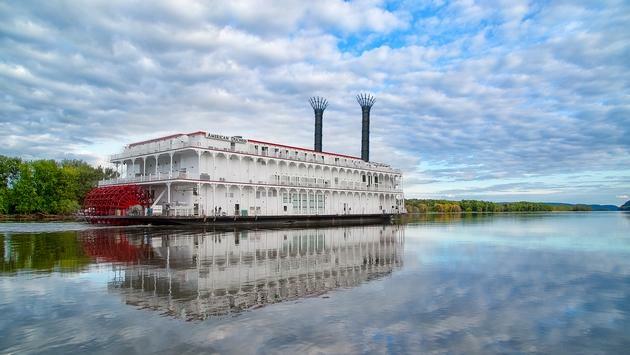 To learn more about American Queen Steamboat Company, check out their blog here.